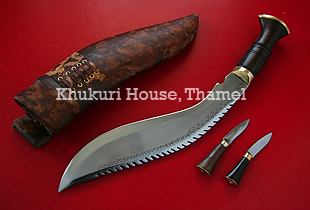 One of the Newest Khukuri blade of 2012 from the stable of Khukuri House known as "Khukuri Draga". Since 2012 is also known as the "Dragon year", why not a Khukuri blade that just looks like one. One of the Newest Khukuri blade of 2012 from the stable of Khukuri House known as "Khukuri Draga". Since 2012 is also known as the "Dragon year", why not a Khukuri blade that just looks like one. "Khukuri Draga" to support this Dragon year and to show Craftsmanship of Khukuri House.